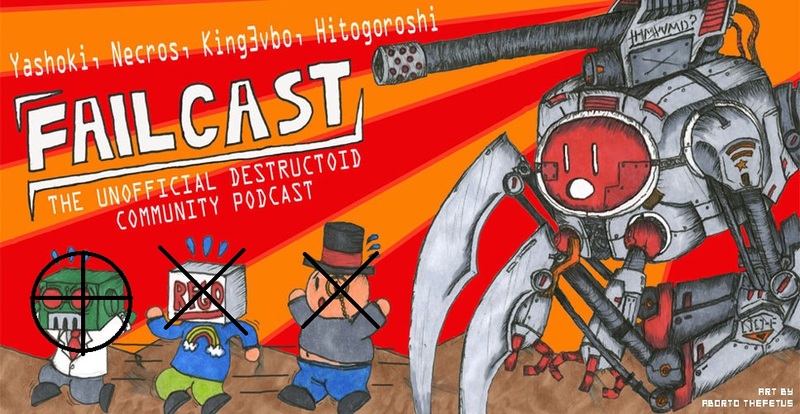 Just a disclaimer: this episode of Failcast is not Gurren Lagann. So, if that's going to be an issue, you probably shouldn't download this. If you realize this, however, and are willing to spend time not watching Gurren Lagann, then feel free to partake of Destructoid's unofficial community podcast. This week-late episode features community guest CrocBox, alongside host Yashoki, Hitogoroshi, King3vbo, and an unusually loud Necros, none of whom are Gurren Lagann. Also, this episode experiments by removing the background music from the discussion, so let us know whether you like the format better or worse in the comments! 02:35 - Something different for once! 52:30 - PC gaming is dead! Also, of note is that we'll be doing a special E3 episode next week, featuring three roundtables staffed by community members. Keep an eye on the cblogs tomorrow (Friday) for information on how you can get involved! Also, email us at [email protected] to be a guest on the show or ask us any questions. This download is not Gurren Lagann, BTW.